Finally, diamond bank has decided to join other banks by introducing it's own unique USSD code for carrying out transactions conveniently without the need for internet connection or visiting the bank. Just like other banks in Nigeria, Diamond bank has always had its own official banking app which let's you pay for bills, check account balance, transfer money, buy airtime and data for yourself or a friend and other transactions. But one of the disadvantages of the mobile app is that internet connection is required. 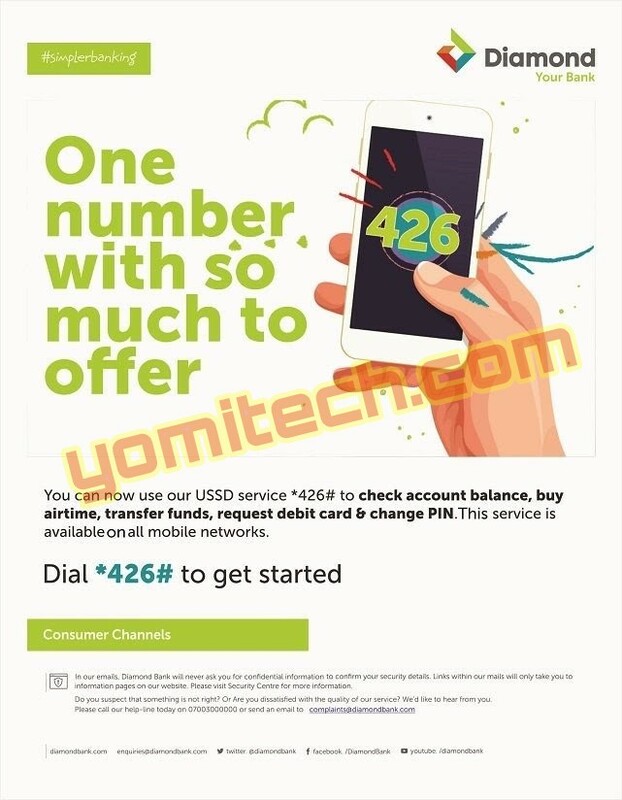 Now with the new Diamond bank ussd short code which is *426#, you wouldn't have to worry about internet connection anymore as you will now be able to perform your transactions offline from the comfort of your home or on the go. >> Changing your banking Pin. >> First, make sure the sim you want to use is the one linked to your diamond bank account. >> Dial *426# on your diamond bank linked SIM card. >> Input the last 6-digit of your ATM card number when asked. >> After that, enter your Account Number and send. >> Then you will have to create a 4-digit Mobile pin (Mpin). >> You should receive a notification message if the registration was successful. >> This will only work on the phone no you linked to your diamond bank account. >> The new USSD code banking platform doesn't require internet connection and it works on all phones.